In this article, we argue that every psychological phenomenon is dualistically both a ready-made frame and an ongoing socially dialogic construction around a recursive breakdown of social relations. Since all social relations are embedded in practices and mediated by communication, they, and consecutively all psychological phenomena, are cultural. However, culture, as a concrete category (i.e., my culture, their culture), rather than as an abstract concept, is also a psychological phenomenon that is dualistically both aimed at explaining and caused by spread of misunderstandings among people and breakdowns of their social relations. We argue that the category of ready-made culture is a dialogic politics of borderwork, differences, and distancing that literally shapes and contours communities while the process of culture-in-action (the terms are borrowed from Latour’s investigation of science) destabilizes, erodes, and redraws the boundaries through dramatic dialogic events. Our analysis of the category of the culture leads us to the four-principle dialogic framework of how to consider any psychological phenomenon in cultural psychology. We applied these principles to research on culturally sensitive guidance in the context of afterschool program involving preservice teachers as a part of their teaching practicum. “We didn’t think it would happen! We came to LACC unprepared. They’re from a different culture. Why didn’t you tell us before what to expect from them? !” These are the words of my (i.e., Eugene’s, the first author of this article) undergraduate, preservice middle-class female teachers participating in a teaching practicum in an afterschool program at the Latin-American Community Center (LACC) in urban Wilmington, Delaware twice a week. From this demand, it was apparent that the students expected me, their instructor for the course “Cultural Diversity, Teaching and Schooling”, to explain to them in advance what is involved in working with those Latino elementary school children so they would not run into the problem of the children “suddenly” becoming “unruly, non-cooperative, and wild” (their words during the class discussion). Consequently, they followed up the above comments and questions with a request: “Tell us about their culture so our work with the LACC kids becomes smooth” (i.e., non-problematic). In effect, the students wanted to set the stage for their relationships with LACC kids by using information about “Latino culture” as a background. But can a culture be told? Does it exist prior to a dramatic event: when a problem emerges, when the relationships are disrupted, when smoothness of interaction and activity disappears? These are the questions that we want to discuss in this article. The students’ statements above were given during a class discussion that took place in the Fall of 2001, in a university classroom of 16 students sitting around a rectangular “table” constructed out of movable desks. As the students’ class discussion progressed, it was clear that there were two roughly equal groups of students who were polarized in their opinions about how much the LACC children were cooperative or non-cooperative. Since these two groups also represented Monday-Wednesday (MW) and Tuesday-Thursday (TT) teams working with similar groups of LACC children (going to the LACC on Monday and Wednesday or Tuesday and Thursday), I became more and more suspicious that something happened with the TT team or that they had done something to generate the non-cooperative reaction from the LACC children. Specifically, my investigation of previous events that the TT team recounted led me to believe that about two weeks earlier they had disrupted an established ecology at LACC. After my class presentation about collaborative classroom management, they decided to develop “the LACC constitution” – a set of conduct rules – together with the LACC children. For that reason, they invited all LACC children into the computer lab room (the most popular room in our program for the children), stopped all the computers games that the children were playing, and switched off all the computers. The students then attempted to discuss possible behavioral rules with the children, however, the children apparently become confused and agitated, and were unable to understand why they were not allowed to play the computer games anymore. Tension grew in the room, and the children become more noisy and non-cooperative. A few fights broke out among the children. The students could not establish order and nor regain the children’s attention. They tried to punish some children but it was in vain. After struggling for about an hour,, they gave up and allowed the children to play games. Since that day, many LACC children became hostile and non-cooperative towards the TT team but the same children continued to be warm, supportive, welcoming, and cooperative with the MW team (who never tried to set up “the LACC constitution”). In order to understand the background of the event, it is important to mention that at the very beginning of the teaching practicum, both MW and TT teams commented how the LACC children were unusually warm, approachable, and welcoming to them. Although the university students expected that they would need to spend some time “breaking the ice,” the LACC children hugged the students, easily revealed personal information about themselves, offered their friendship, and invited the university students into their activities from the first day on. Our students attributed the ease of the LACC children in interacting and relating towards them to “the Latino culture.” Another important aspect of the background to mention, as our class discussions showed, was that the majority of my students had a rather traditional schooling background, and they were primarily concerned with discipline and absolute control over children; but through the class, the students became more and more interested and appreciative of innovative collaborative instruction. Finally, it is important to point out that at the beginning of the practicum, the LACC children experienced a rather mean and disrespectful computer instructor who did not allow them to play computer games, but instead insisted on them learning Word processor functions from a software manual in a (what could be fairly described as) meaningless way. The LACC children were in an open conflict with the computer instructor and called him names in his face (and even threw paper balls and gnawed apple cores at him). In the stories told by the TT team to the class, the children’s reaction to the shut down computer games was very similar (but not as severe) to their reaction to the computer instructor, who also always demanded children to quit using the computer games as soon as he entered the computer lab at the LACC. Now let’s go back to the question of whether or not I could tell my students about “the Latino culture” to prevent the disrupting event of “writing the LACC constitution” from occurring. Is education for preservice teachers about telling them everything that could prevent negative events from occurring in their future work with children? If we assume that my analysis of the events that occurred at LACC presented above is correct, could something have been done beforehand to prevent the negative events? Furthermore, how can the relationships between the backgrounds of the participants (LACC children, university students, the computer instructor at LACC and my own -although not fully presented in the story above) and the described event be defined? Are events caused by the participants’ backgrounds or are the backgrounds are constructed by the events by emphasizing some parts of the participants’ past and deemphasizing the other? Can it be both? More specifically, when might a background precede or come after the described event? On first glance, the last question is rather strange: of course, people’s backgrounds pre-exist the events; that is why they are called “backgrounds”. However, given a closer look, these “backgrounds” were irrelevant for the work of the MW team. For example, the fact that the LACC children experienced a mean computer instructor did not affect the work of the MW team with the LACC children in any way. In that sense, the mean computer instructor was NOT a background for the MW team’s work and relationships with the LACC children. In the same vein, it can be argued that the mean computer instructor was not a background for the TT team BEFORE the infamous event of developing “the LACC constitution” occurred. Yes, it is true that the mean computer instructor was a part of the LACC children’s experience but like their many other experiences it might have never become “backgrounds” in the events and relations among the university students and the LACC children. Can it be that “backgrounds,” or what my students otherwise would refer to as “cultures,” are by-products rather than precursors of the dramatic events that people experience? Do cultures reveal/manifest themselves in dramatic events when relationships among people get disrupted, as a traditional view on cultures suggests, OR are they constructed in and by the events? In this article we will take a dualistic, pragmatic, dialogic, and relativistic stand on this issue. We argue that under some conditions it is more useful to consider “cultures” as precursors of dramatic events in which the “cultures” reveal/manifest themselves, while under other circumstances it is more useful to consider “cultures” as a byproduct of the dramatic events in which “cultures” are constructed and framed. This usefulness has a dialogic communal nature. In this approach, we are inspired by dualism in quantum physics according to which an electron can viewed by an academic community of physicists both as a wave -- when one studies a pattern of the distribution of a beam of electrons passing through two small holes in a wall on a screen - or as a particle -- when an impulse effect of the beam on the screen is studied. Thus, depending on the focus of the research grounded in the dialogic nature of the academic community (i.e., any research is an argument in an ongoing dialogue-debate of scientists), it is more useful to consider an electron as a wave or as a particle. Another inspiration for our dualistic-pragmatic-relativistic approach has come from Latour’s ethnographic study of biological science in which he establishes a dualistic view of science as ready-made-science and science-in-action (Latour, 1987). Latour convincingly argues and demonstrates that when biological scientists (and technicians) use well-established and reliably working tools/devices and non-problematic scientific statements – what Latour calls “black boxes”– science can be most usefully considered as ready-made-science. However, when biological scientists deal with non-reliable tools/devices and problematic scientific statements, it is more useful to consider science as science-in-action. Latour uses the Greek metaphor of the double-face Janus to illustrate this dualism, in which science often has two faces saying opposite things: the ready-made-science face can claim, “Once the machine works people will be convinced”; while the science-in-action face says, “The machine will work when all the relevant people are convinced” (p.10). Latour promotes a dualistic view of science as both ready-made and in-action depending on the studied phenomenon and argues that a monistic view of science as either ready-made or in-action is not useful. The sole ready-made-science approach cannot explain the complexity, messiness, and hybridism of scientific practice at its frontiers. Similarly, the sole science-in-action approach can paralyze scientists, who instead of using well-established tools/devices and non-problematic scientific statements, would try to problematize all of them (i.e., try to open all “black boxes” in Latour’s terms). Thus, there is a somewhat artificial separation of ready-made science and science-in-action, when, in actuality, all science involves elements of both. So then the really interesting question/issue is when one approach should take primacy over the other. Similarly, Soviet semiotician Lotman (Lotman, 1988) provided a dualistic description of text as having two functions at the same time: one strives for maximum univocality between the author and the reader (i.e., “ready-made text” in Latour’s terms) and the other one is multivocal and new meaning oriented (i.e., “text-in-action”). We propose that culture can also be viewed BOTH as “ready-made,” when well-recognized recursive events disrupt the communicative and relational flow of people’s activity on a systematic basis, AND as “in-action,” when a dramatic event disrupting that flow is recognized for the first time (see Figure 2). Within this approach, it is important to emphasize that in both cases “culture” is an explanatory narrative frame existing among other possible explanatory frames. For example, a student who violates a teacher’s expectations by not making eye contact while the teacher is addressing him may or may not be usefully framed as a “cultural phenomenon.” It is possible to explain the event disrupting the flow of the teacher-student communication (and relations) using individualistic explanatory narrative frames: i.e., the student is rebellious, has attention deficit (e.g., “autistic child”), is shy or ashamed, the teacher is mean to him, and so on. These explanatory narrative frames split individuals on “mean” and “kind” (teachers), “rebellious” and “obedient” (students), “autistic” and “normal” (students), and so on. However, it is also possible to use frames referring to “culture” that split people onto relative stable social groups. From this frame, the teacher and the student can be seen to belong to two different cultures: both of them are well-meaning but show their respect for each other in different ways. In the teacher’s culture to show respect means to establish eye-contact, while in the student’s culture to show respect means to avoid eye-contact. In the teacher’s culture eye-contact is a sign of respect, while in the student’s culture, the same eye-contact is a sign of challenge and disrespect (Philips, 1993). We can view these differential ways of showing respect between teacher and student through Pratt’s (1991) notion of a “contact zone of pedagogy,” involving the intentional putting of different cultures in common “social spaces where cultures meet, clash, and grapple with each other, often in contexts of highly asymmetrical relations of power” (p.34). In the case of the Native American students and white-middle class teachers studied in Philips’ study, this contact zone was present from the beginning, although it was not well recognized by the white teachers. From the “ready-made culture” approach (old Janus’ face on Figure 2, left), Philips has discovered cultural differences in the communication of respect between the students from Native American communities and the teachers from white middle-class communities. From this approach to the problem, distinct cultures and communities can be said to pre-exist the disrupting dramatic events of cultural misunderstanding in the classroom. The need for “knowledge” of pre-existing cultural differences in communication would then be considered essential for white-middle class teachers of Native American children, for a teacher’s guidance to make sense to these children. The “culture-in-action” point of view (young Janus’ face Figure 2, right), however, would address the recursive communicational and relational breakdowns among classroom participants, and recognize that Philips has purposefully constructed a new explanatory frame separating people communicatively into two relatively stable social groups: whites (teachers) and Native Americans (students). This separation may well be proven useful by some relevant educators. These explanatory frames create and generate “cultural borderwork” (Barth, 1969; Thorne, 1993) through the participants’ recognition of the reoccurring disruptions of their expectations, discomforts, and miscommunications, now framed by them into narratives about “differences” or “cultures” distributed across the now-visible social groups (e.g., white teachers versus Native American students, see the top of Figure 3). Cultural borderwork involves “culturalization” of recursive communicative and relational breakdowns and discomforts by using discursive narratives/frames of “cultural differences.” “Distinct cultures” and “communities” are constructed by the explanatory narrative frames involving references to “differences”, “cultures”, “social groups”, and “communities” as a way for them to deal with the disruptive dramatic events in their joint lives. So, which of the two approaches to culture is more correct? Our dualistic approach to the notion of culture, like Latour’s approach to science and quantum physics’ approach to electrons, is relativistic because it heavily depends on the observer’s research focus. However, these relativistic approaches are also pragmatically relativistic because they focus on most useful descriptive models – on the purpose of the observer  – and abandon the question of “what is really true” understood outside of pragmatics of human activity. Electron is both a particle and a wave. Culture is both ready-made and in-action. Latour argues that both approaches: “the ready-made science” and “science-in-action” are can be very useful as well as can be very limited. The usefulness of “the ready-made science” is an unproblematic use of “black boxes”: well-established and reliable tools, devices, procedures, theories, knowledge, facts and so on. If a scientist tried to “open” all “black boxes” he or she uses by challenging them, he or she would never accomplished the primary research task set. The usefulness of “the science-in-action approach” is in dealing with science frontiers when the scientific community is not convinced about statements produced by the scientist. Treating these unaccepted-yet statements as “ready-made” by the scientist can easily marginalize him or her in the scientific community as “arrogant” and potentially may lead to dismissing these statements all together (Latour, 1987; Latour & Woolgar, 1979). As Latour shows, science-in-action eventually transforms into ready-made science when the statements become accepted by the relevant academic community –closing “the black box.” The contrary is also true that ready-made science can again become science in action: in the process of investigation some statements, tools, devices, and theories previously being accepted and seen as reliable can be open for challenging and investigation – the “black box” can be open by the scientist. Similarly, ready-made-culture and culture-in-action approaches can be useful and limited. The ready-made-culture approach is based on the borderwork process – defining relatively stable social groups across recursive communicative and relational breakdowns by building boundaries between them. As such, its potential positive pragmatic power (i.e., positive “affordances” using Gibson’s (1979) terms (grounded in his or her community of practice (Lave & Wenger, 1991)) is in promoting mutual respect between the defined groups (i.e., cultural respectful distancing). Its potential negative pragmatic power (i.e., negative “affordances”) is in providing opportunities for oppositional solidarity (Sherif, 1988), and, at the extreme, for “cultural wars” that position “us” against “them”. Further, when cultural differences become an explanatory frame for recursive communicative and relational breakdowns, this explanatory frame can produce new recursive breakdowns in its own turn. One must not, however, imagine the realm of culture as some sort of spatial whole, having boundaries but also having internal territory. The realm of culture has no internal territory: I is entirely distributed along the boundaries, boundaries pass everywhere, through its every aspect, the systematic unity of culture extends into the very atoms of cultural life, it reflects like the sun in each drop of that life. Every cultural act lives essentially on the boundaries: in this is its seriousness and its significance; abstracted from boundaries, it loses its soil, it becomes empty, arrogant, it disintegrates and dies (Bakhtin & Emerson, 1999, p. 301). In the realm of culture, outsideness is a most powerful factor in understanding. It is only in the eyes of another culture that foreign culture reveals itself fully and profoundly. A meaning only reveals its depths once it has been encountered and come into contact with another, foreign meaning: they engage in a kind of dialogue, which surmounts the closeness and one-sidedness of these particular meanings, these cultures. We raise new questions for a foreign culture, ones that it did not raise itself; we seek answers to our own questions in it; and the foreign culture responds to us by revealing to us its new aspects and new semantic depths. Without one's own questions one cannot creatively understand anything other or foreign such a dialogic encounter of two cultures does not result in merging or mixing. Each retains its own unity and open totality, but they are mutually enriched (Bakhtin, Holquist, & Emerson, 1986, p. 7; also cf. Mead & Morris, 1974). The ready-made-culture approach informed by Philips’ study can be very useful for white teachers working with Native American students because it promotes respect for students rather than circles of mutual hostility or the drawing on of a deficit model in response to a disrupting event. The white teacher can conceptualize the fact that a Native American male student breaks her expectation by avoiding eye-contact not because of his disrespect or attention deficit but because there is a different way of how people show their respect to others (especially towards elders and to those in authority) in his home community. However, although the ready-made-culture approach can be useful in interpreting misunderstanding and establishing mutual respect, its usefulness is limited because it does not help to guide how the reoccurring misunderstanding recognized as cultural can be resolved. Even if the white teacher reads the behavior of avoiding eye-contact by the Native American student as respectful but culturally different, it does not help the teacher to find a way how to communicate with the Native American student since her own (cultural) way of attending is not reciprocated by the Native American student (and vice versa). The sole use of the ready-made-culture approach leads at best to cultural distancing – when the cultures are mutually respected –or at worse to cultural wars – when one culture tries to subdue or eliminate the other culture (Hargreaves, 1994). The ready-made-culture approach does not guide how to “bridge” the cultures (Figure 3). Criticizing Pratt’s notion of “contact pedagogy” based on the ready-made approach to culture, Harris (1995) argues that the challenge formal education faces is to “learn not only how to articulate our differences but how to bring them into useful relation with each other” (p.35), a plea which calls for the guiding power of the culture-in-action approach. To illustrate the process of creolization we return to the case with which we started our paper, “a cultural conflict” that developed between a group of University white middle-class female undergraduate students and mainly Latino children in the afterschool setting of the Latin-American Community Center. 5) the class instructor and other UD leaders of the project who saw learning opportunities in the current situation. 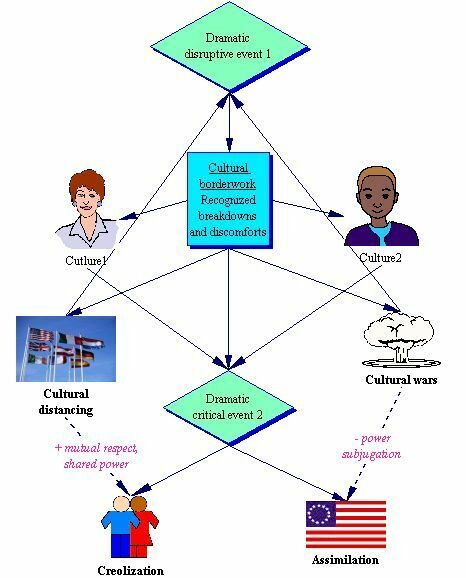 The cultural borderworks among some of these groups could be characterized by cultural distancing and mutual respect (left side of Figure 3). However, the borderwork between the Tuesday-Thursday group and the LACC children developed into a “cultural war,” bringing mutual blaming and oppositional solidarity. Discussions of this precarious situation could lead to “spilling” the cultural war, expanding the blaming and oppositional solidarities onto the other borderworks and cultural groups. This could result in the MW group siding with the LACC children, as the LACC administration sides with the TT group. Meanwhile, the TT group would blame the class instructor both for having a time-intensive and not very educational teaching practicum, and for his lack of support and guidance. 3) the official public space for planning and coordination of the project by the LACC administration and the UD leadership. Business-as-usual was both continued in the three public and official spaces but also disrupted by a critical dialogue among all the participants about achieved “strengths” and “future necessary improvements” for the project. The proposed critical dialogue disrupting the normal routine of the project and focusing on tensions and breakdowns could be potentially dangerous, potentially resulting in a public eruption of the existing tensions that could lead to even more mutual blaming, oppositional solidarity, and cultural warfare. However, the critical dialogue which occurred in all three public official spaces involved non-cultural narrative frames with an emphasis on common achievements (i.e., “project strengths”) and common problems (i.e., “necessary project improvements”). The instructor talked with both groups in class, asking them what strengths, problems, and improvements they saw in the projects, and suggesting that the students ask both LACC staff and the children to help them figure this out as a part of new class assignment. The LACC staff brought the issue to the joint UD-LACC meeting of the project leaders. The results of the critical dialogues as interpreted by the UD leadership are presented in Table1. LACC children Fun to be with and play with UD students, friendship with the UD students, the students are nice For all UD students to be fun and not boring, bossy, and unfair; for the students to come everyday, come earlier and stay longer; more fun games and less kids’ fights at LACC. Lack or engagement from the TT students and their bossiness and unfairness; bossiness of the LACC staff; more safe and orderly environment at the LACC. UD project leaders Creation of a safe learning environment for all the participants Creating a public open discourse about problems, involving parents and teachers of the LACC children in the project Prevailing private discourse of blaming, group oppositional solidarity, adversity, and mutual sabotage; disengagement with each other. The culture-in-action approach provides guiding and analytical foci for developing new communal identities and building new “WEs” rather than focusing on differences and similarities (and the reasons for them) as with the ready-made-culture approach. The question is not whether creolization is more desirable or fully possible – in some cases, for some participants, it may be not desirable and probably is never fully possible. However, when the focus is on studying the emergence of new “WEs” or guiding to that goal, the culture-in-action approach becomes handy for researchers and practitioners. Of course, this new “WE,” while eliminating or weakening some borderworks within the community, can help to develop borderworks outside the created community by providing possibilities for new cultural frames of how “WE” in the community are different from “THEM” (“those people” who are seen as outsiders when communicative and relational breakdowns emerge). 4.Psychological phenomena involve dramatic/collusive events in the lives of people. We will now turn to an illustration of how a dialogic framework can be useful in understanding the concept of culturally sensitive guidance. We chose to focus on this concept because we believe that it is the central concept for educators (and we are educators). We define culturally sensitive guidance as the promotion of learning/teaching that makes sense to and valued by the learner and his or her community. It is useful to explore how culturally sensitive guidance can be viewed from our double-Janus face, how it can be conceived dualistically, pragmatically and relativistically, and how it can be approached as both a “ready-made” set of pedagogical tools and “in-action” as a process of dialogue through which teachers’ and students’ subjectivities are accessed and shared as a response to emergent breakdowns and disruptions of teacher-student relations. The goal of culturally sensitive guidance is to expand possibilities for teachers and students and the students themselves to relate to one another, to develop new dialogic engagements, new ways to relate to themselves and to others in the world (Bibler, 1991). In short, culturally sensitive guidance is concerned with learning as seen as a process of transformation of students’ subjectivity (i.e., their understandings, worldviews, dispositions, identities, skills), a transformation which is a relational rather than an individual achievement (cf. Gergen, 1994). It is best to understand culturally sensitive guidance in terms of what it is not. Culturally sensitive guidance is not comprehensive objectivizing of students by teachers, a process of solely treating the students as an object (or thing) of pedagogical actions rather than as partners in learning. This kind of objectivization results in teachers having NO access to the students’ subjectivity and, thus, in insensitive, blind guidance. This blindness to the students’ subjectivity has several major consequences. A teacher in this comprehensive objectivizing position must guess at what the students’ understanding is and how the content of his or her own instruction is relevant to the students’ lives and needs. The teacher’s guesses are often based on his or her familiarity with the students’ backgrounds. These guesses usually work better — although not necessarily well — when the students’ background is similar to the teacher’s. Most pre-service teachers from mainstream backgrounds do not have the degree of understanding or comfort with the life experiences/subjectivities of children from non-mainstream backgrounds (Aaronsohn, Carter, & Howell, 1995; Cabello & Burstein, 1995; Freeman, Brookhard, & Loadman, 1999; Liston & Zeichner, 1996). Thus, the comprehensive objectivizing of students is especially problematic for teaching culturally different children. The consequence of instruction based on comprehensive objectivizing is that the learning opportunities of teaching activity – whereby students’ understandings, activities and subjectivities can be transformed – are often not realized. We are not, however, trying to argue against a teacher’s objectivizing of her students – eliminating of objectivizing is not only impossible but is not even desirable because students’ lives are rooted in their material bodies and material circumstances of broader cultural contexts. Thus, students are legitimate objects of pedagogical actions – actions aimed at changing the material circumstances of the students’ lives. Objectivizing involves attributing a state to a person (or an object) in order to act upon and transform this state. For example, knowing that a child is hungry and does not have shelter may help to explain his or her behavior in the classroom and thus may help to develop actions that improve the child’s learning and even life conditions. In this way, objectivizing is related to ready-made cultural borderwork that meets the needs of a child, and that uses the plausible reasons for a child’s behavior to improve the child’s relations to the classroom and to her community. Such objectivizing is respectful of the child, and is used to recognize the child’s strengths, understand her human needs, and so on, as well as to address any discoordination between instruction and those needs and concerns at the moment. However, unlike lifeless things, students are partners in multiple dialogues, and as such, actively define the meaning and the context of an objectivizing statement made by the teacher (cf. Soros' notion of reflexive statements in Soros, Wien, & Koenen, 1995). The comprehensive objectivizing of other humans thus ignores the fact that objectivizing always has a dialogic (i.e., subjectivizing) aspect (Bakhtin & Emerson, 1999; Bakhtin et al., 1986). Comprehensive objectivizing actively disregards this dialogic, creative aspect of human activity and the agency of the objectivized, but it cannot escape it. Comprehensive objectivizing is still always dialogic by its nature, sometimes even despite its explicit intention, because it implicitly sends a dialogic message to the person targeted in comprehensive objectivizing that this person is disrespected, dehumanized, embarrassed, and/or humiliated by the objectivizer. This condition creates an undesirable learning environment because it destroys trust between the teacher and the student necessary for sensitive guidance. In contrast, dialogic objectivizing, although also attributing a state to a person to act upon, expects a dialogic response from the objectivized and, thus, respects the dialogic agency, humanity, and dignity of the other person (see below our example of dialogic objectivizing). Objectivizing can thus be respectful, just as the ready-made cultural approach can be respectful in its production of cultural distancing. We will provide an example of this as we recount the dramatic dialogic events surrounding the encounters between Charisma and the UD students in the fall of 2001. “[Diagnosis] I do fear for her. She is one of those borderline children who is walking on a tight rope, trying to decide what the right thing for her to do is… I have a feeling she is involved in a few unsafe extracurricular activities. The preservice (student) teacher here has made little or no attempt to understand the girl’s own needs or concerns, assuming that she is a “borderline” child. Nora did not plan to talk with Charisma to examine whether her suspicions and worries about Charisma were correct or what Charisma herself thought about the interpretation of her behavior and its meaning. The preservice teacher’s engagement with the concerns and needs of the child was inhibited by the teacher’s presumption of a need to ameliorate a pre-disposed weakness believed to be exhibited by the girl through the culturally available discourse of “diagnosis” and “treatment” (through which comprehensive objectivizing is readily expressed). Charisma rejected Nora’s and the other preservice teachers’ imposition of their “positive role model” and “positive influence” on her and instead was actively seeking dialogic relations with them. She achieved success in building such dialogic relations with some of the preservice teachers but not with Nora who ultimately chose not to engage in a dialogue with Charisma during the teaching practicum. Comprehensive objectivatization denies subjectivization (i.e., a genuine dialogue between the teacher and student) and thus monopolizes guidance. Like monopoly of the ready-made culture leads to distancing between social groups (see Figure3), monopoly of objectivization leads to disengagement (i.e., non-dialogue) between the teacher and the student. Comprehensive objectivizing of students does not work well for any student. However, the problem is worse for teaching culturally different children (due to many educators’ unfamiliarity or discomfort with children from culturally different backgrounds). Thus, providing culturally sensitive guidance to culturally diverse children will improve education for all children. An important insight of this critique of instruction based on comprehensive objectivizing is that culturally diverse children and mainstream children do not need a different type of education. The other side of the double-Janus face of culturally sensitive guidance is subjectivizing of students, an intersubjective process of dialogic engagement with students in order to understand their specific circumstances, particular needs, and interests. Subjectivizing of students and teaching allows for transformation of students’ understanding which in turn results in a transformation of identity and becoming (e.g., becoming a more competent member of a community). Subjectivizing encourages a process of never-ending, open-ended and honest dialogue between the teacher and the student in response to critical dialogic events. Such responsive dialogue promotes the development of a new “we” (creolization). It is precisely this process of subjectivization that is often understood by our UD preservice teachers and by the LACC children as a “friendship.” The subjectivizing of students is achieved through iterative interactions by which the teacher grasps meaning in the child’s life and, thus, accesses the student’s subjectivity by dialoging with the child. Notice that, at least, from the presented webposting, it appears that Charisma’s subjectivizing of the preservice teachers (e.g., talking with them, being interested in their lives, desiring to become friends and to be with them) was not fully reciprocated by the preservice teachers: they did not ask Charisma about her life and they did not check with Charisma about their worries and concerns about her behavior and its meaning. Despite this lack of reciprocity, Charisma’s subjectivizing of the preservice teachers made an “impact” on Kristen and “excited” her, the result of which probably sparked Kristen’s future interest in Charisma as a dialogic partner. However, such dialogue may not necessarily be characterized by mutual respect or open-endedness. A child’s life and experience may be assimilated into a narrower set of cultural expectations in response to a critical, dialogic event (see examples of the students’ postings about Charisma above and below). Both assimilation and creolization, however, can be contrasted with the traditional comprehensive objectivizing approach, where the dialogue would not even be attempted or considered. The comprehensive objectivizer presumes to already fully “understand” the child’s pre-dispositions; the causes of the difficulty and successes of their teaching lie before the interaction takes place with the child. However, like culture-in-action, assimilation and subjectivizing instruction/learning emerge directly from interaction with the student. Such engagement is characterized by a recursive, dialogic process: by your response to me I will figure out what my previous statements and actions mean to you (cf. Bakhtin et al., 1986; Mead & Morris, 1974). It is important to note that just because we dialogue with one another in a community does not mean that we become the same, or that we are all assimilated into one another over time. Rather, Mead (in discussing the “mirror self”) has concluded that the only way to get to individuality is through social interaction with others. Individuality requires dialogue and a community behind that dialogue. Through dialogue, subjectivizing provides access to students’ understandings, allowing for the students’ needs and concerns to be transformed and expanded through teaching action. Assimilation actively suppresses such individuality through a concern with regaining control and reducing the power of the student to redefine his own actions and the actions of others. In the dialogic approach to culturally sensitive guidance “in-action,” “understanding” is not a longitudinal process with a definite beginning and end. In a traditional comprehensive objectivizing approach, learning has its end: the teacher is assumed to not be needed after the student fully “understands” the instructional objectives – after the objectivized state of the student is transformed into the shape desired by the teacher (and people behind the teacher). This state of the student later can be assessed by some standardized learning tests. By contrast, in subjectivizing teaching/learning in particular, progress is not seen in terms of approaching “the” final outcome. Rather, there is an emphasis on learning as a process of change in understanding. This process assumes that people need each other in order to learn, to teach, and to live. Students and teachers engage in dialogue, the goal of which is not to exhaust each other, demonstrating that they fully understand something to each other. (There is no assumption in dialoguing with the child that the teacher “fully understands” the students. There is also no assumption that the student must “fully understand” something in order to do something, or to become a “super-individual” not ever needing other people). This exhaustion process shows directionality in learning, but it can easily result in a continued cycle of comprehensive objectivizing of a child, a continued and sustained use of a medical discourse of diagnosis and treatment, where the teacher tests to make sure the student understands and the students’ actions continuously reveal evidence or absence of the need for further diagnosis and treatment. We will now reconstruct the events surrounding Charisma and the UD students in the fall of 2001 in order to demonstrate that these events are characteristic of dramatic dialogic events that involve transformation of existing relations in response to disruption rather than recursive disruptions of relations that emphasize collisions and drama, and an ideological incompatibility of relations. We will then discuss the significance of these dramatic dialogic events for culturally sensitive guidance. Notice that the student’s question about whether Charisma’s brothers actually lived with her was an attempt to respond to Charisma’s “amazing” statement that she has 19 brothers rather than any evidence of Alice’s genuine interest in Charisma. Alice did not report Charisma’s answer to her question (about whether the brothers all lived with her) because, in a way, her question seemed to be rhetorical. The students’ attraction to Charisma continued until the 5th week of the UD students’ visits to the LACC. At the beginning of the week, on Monday, November 5th, 2001, just before leaving from the LACC, a few students came to Eugene (the class instructor) and told him that Charisma wanted to talk with him. Charisma was waiting for Eugene with her mother at the exit of LACC. She explained to Eugene that she had been suspended from school for a week for drinking in school and she wondered if she could go to the University of Delaware to sit in on classes with the UD students during the week. Charisma’s mother begged Eugene to bring Charisma to the University because she was afraid that otherwise Charisma would spend all the time wandering the streets. Eugene promised to discuss the whole matter with the students in class the next day and he let Charisma’s mother know about the decision and arrangement through an LACC officer. The whole conversation took place in the presence of the UD students that came to LACC on that day. On 25 minute van trip back to the University, Eugene discussed the matter with the students. All students were enthusiastic about Charisma coming to the University of Delaware. They were discussing which classes, besides their Cultural Diversity class, were good for Charisma to attend in order to excite her about education. The students also discussed what other places they could bring her (e.g., their dorm rooms, the student cafeteria, University library). The next day, on Tuesday, Eugene shared Charisma’s request with the rest of the students during the class meeting. All the students seemed to be enthusiastic about Charisma’s upcoming visit. They developed a plan for who would take Charisma with them and where they would bring her. After the class, Eugene contacted an LACC officer and asked him to arrange Charisma’s visit. Early in the morning on Thursday, November 8th, on his way to University, Eugene drove to the LACC and picked up Charisma who waited for him with her thankful mother. In the car, Eugene asked Charisma to describe in detail what happened at school: why and under what circumstances Charisma drank, with whom she was caught by the school administration, what happened next, what her reaction was as well as the reaction of her friends and family, and what her aspirations were for the future. In Eugene and the UD students’ cultural diversity class, Charisma actively participated in discussions about Japanese education and the video “Preschool in Three Cultures” and was apparently happy to be at the University ( she asked Eugene to bring her again). The students seemed also to be pleased that Charisma was with them. They showed her their student dormitories and brought her to some other good classes that Charisma really liked. On the way back to the LACC from the University with a group of the students in the van, Charisma exclaimed that she never knew that education could be such an easy and exciting endeavor. There were no students’ webpostings discussing the event except one strictly logistical posting. “Amy i agree with you. It does seem like she was being rewarded for doing that. I believe she loves to do everything she does for attention. And she most certainly receives alot of attention from all of us. Including me i like her alot and I think she is fun, but i am definitely really worried about her (Sarah, webposting, 11/09/2001). I think it was a good thing though that she was bored being at home (maybe it will make her think twice before doing something that would get her suspended), and while it may not be the perfect example, her coming to visit did keep her off the streets and out of trouble for the day (though I don't know what she does during the day when she's not at school so....) I'm hoping that her coming today made her maybe want to go to college and will maybe now make her put extra effort into stuff, I don't know though. But I know where you're coming from, because, in a sense, it does seem like she's being rewarded for being bad..... (Laura, webposting, 11/08/2001). Eugene was extremely surprised about the switch in the students’ attitude toward Charisma’s visit to the University which had been--before, during and immediately after the visit-- extremely positive (the students seemed to be moving towards greater interest and engagement in Charisma’s life) . Ann’s posting questioning the usefulness of Charisma’s visit and the students’ replies to it puzzled Eugene. When Eugene later shared his frustration with his colleagues at the University, one of his colleagues, Cris Mayo, suggested that the postings may reflect the students’ existence as white middle class females in a white male dominated society, who are getting ahead by following the rules established by the male dominated society. From this point of view, Charisma’s misdeeds were “rewarded” by the University instead of being punished, as would be the expected outcome for “a nice girl” (Mayo, personal communication, February 2002). I respectfully disagree with all of you. When people do mistakes, like Charisma did, they need help more than punishment. In my view, the best help to Charisma is to reconnect her to school and excite her about school. I know many kids that unfortunately are happy when they are suspended from school because they do not see anything good in school except having an opportunity to spend time with their peers. I also do think that in many cases suspension is a VERY bad punishment because it leads to even more alienation of a student from school and to dropout (as statistics show). In Lynn’s posting (above), objectivizing of Charisma, as a consequence of Eugene’s reframing of the dialogue, has switched from comprehensive to dialogic objectivizing, towards objectivizing that is useful for dialogic action with the girl. Interestingly, however, Lynn’s message still is presented as an agreement with Ann’s original posting, characterized clearly by comprehensive objectivizing of the girl (with Lynn clearly acknowledging the behaviorist discourse of reward and punishment for diminution of perceived deficits). Alongside such discourse, however, Lynn recognizes that Charisma might need “help,” an objectivizing that leads to a clear request to find out what sort of help she might need (necessitating dialogue). charisma and i just talk about stuff. i talk to her like one of my friends...tell her whats going on in my life and she tells me what’s going on in hers. its just very cool how close we've become since we started going to the LACC. she definitely wants to come back to the university. i keep in touch with her via email, phone and when i go home most likely through the mail. we really impacted her a great deal, and i know her mom is sooo happy. she always tells precious to say hi to me and whenever we went to the lacc she made a point to come up to me and talk. its just very rewarding. (Alice, webposting, 11/26/2001). Alice is mentioning that she and Charisma talk to each other as friends, which is a marker of subjectivizing. They are interested in each other, and what they are saying to each other. They want to know more about each other’s lives, and work to “keep in touch” with each other. It is clear that Alice is not assuming that she knows about Charisma’s life and how to interpret it for Charisma. I think that the biggest help we can offer to Precious is to galvanize her interest in going to college. She asked me on Thursday if I and Prof. Golden (the class Precious visited) are permanent teachers. I said, "Yes. Why?" Precious replied, "Because I'm going to come to you and take your classes when I go to the University of Delaware!" She also wanted to be with you all but she learned from some of you that you won't be around when she graduates from High School. I asked her if she knows what to do to get to the University and she replied, "Become more serious and ask for help." This is what I mean by helping her! (Eugene, webposting, 11/12/2001). Of course, simply a change in Charisma’s attitude does not necessarily mean that there will be a change in Charisma’s chances to get a good education, since her school does not necessarily provide her with adequate support and guidance. However, Charisma has learned from the experience of being at the University—mediated and guided by interaction with our University students—that the school can be very different: relevant, welcoming, supportive, interesting and engaging. What have we learned from this case about culturally sensitive guidance? In this case, we have two instances of guided learning as transformation of students’ subjectivities: 1) the students’ subjectivity was transformed from comprehensive objectivizing to subjectivizing of a Latina girl, guided by Eugene; 2) Charisma’s subjectivity was transformed from disliking school to desiring to attend the University, guided by the UD students. In both of these cases, learning involved the accessing of students’ (e.g., UD students in the first instance, Charisma in the second instance) subjectivities by people in a guiding role (e.g., Eugene in the first instance, the UD students in the second instance). In the first instance, the access of students’ subjectivities was done through both classroom and web discussions that involved deliberate collisions of incompatible positions: the students seeing Charisma’s visit to UD as “rewarding” her for her transgressions, while Eugene seeing the visit as an opportunity to reconnect Charisma to formal education. In the second instance, the access to Charisma’s subjectivity was done through interviews assigned in the class, informal conversation at the LACC, conversation during her visits, phone calls, and electronic (instant messaging) exchanges that involved a shift from dialoguing about Charisma with each other and the instructor, to dialoguing with Charisma. From a “ready-made” approach to culturally sensitive guidance, culturally sensitive guidance is a pedagogical toolkit aiming at avoidance of disruptions in the teacher-student relations. So, for example, in the first instance, having class and critical web discussions about a teaching practicum as a safe learning environment (where UD students’ pedagogical mistakes are not “costly” for all the participants including the LACC children) constitute such a pedagogical toolkit. In the second instance, the pedagogical toolkit for culturally sensitive guidance involves students’ assigned interviews with the children and students’ asking questions of their own interest about the children to the children. From an “in-action” approach to culturally sensitive guidance, culturally sensitive guidance is a pedagogical process of accessing and sharing the teacher and students’ subjectivities as a response to breakdown and disruption of teacher-students relations. In the first instance, the process of accessing and sharing the teacher and students’ subjectivities involved critical dialoguing between the instructor and the students about their approaches to how to deal with Charisma’s drinking in school. Meanwhile, in the second instance, this process involved students’ desire to learn about the child through dialoguing with her rather than just about her. Culturally sensitive guidance as a “ready-made” approach is useful for the designing of a pedagogical classroom environment that supports the opportunity to engage in culturally-sensitive guidance on the subject matter. However, it does not guarantee that such culturally sensitive guidance will actually occur nor what to do when it actually occurs. Culturally sensitive guidance as an “in-action” approach is useful for dealing with disruptions and breakdowns of relations at hand, but does not guide an instructor how to design a pedagogical environment that promotes breakdowns and disruptions of relations on the subject matter such as cultural diversity, math, English, and so on (in contrast to breakdowns and disruptions of teacher-student relations around grades, pleasing the instructor, minimizing classroom workload and so on). In both instances, culturally sensitive guidance is in response to and occurs through a disruption of existing relations. In the first instance, faced with students’ discourse about how to punish Charisma more effectively for her drinking in school, Eugene was upset with his students because it appeared to him that they were becoming “institutional abusers” rather than culturally sensitive teachers as a result of their participation in his cultural diversity practicum class. It would be very difficult for him to continue his previous relations with the students, taking into consideration the role that the students were assuming in relation to Charisma. In this sense, Eugene replied to Ann’s posting with a desperate attempt to reconnect to his students. In the second instance, faced with Charisma’s drinking and bad grades in school (and seeming carelessness about poor grades), the students shifted more and more into an aggressive moral stance, preparing to strike Charisma for her transgressions. Their relations with Charisma were at the point of breakdown (although they may not have recognized this), despite the fact that they were obviously attracted to her from the beginning. In both instances, the disruption of relations occurred around issues of cultural diversity—the targeted subject matter of the class. The paradox of culturally sensitive guidance is that the instructor does not know what is relevant and useful to the student (the teachers’ uncertainty), while the student does not know how to help the instructor to guide him or herself (the students’ uncertainty). In our view, this paradox can be resolved only in a teacher-students dialogue. In an educational process, meaning (and success) of the teacher’s guidance is defined by the students’ responses (immediate and postponed) to the teaching that generates and addresses the students’ concerns and issues; while meaning of students’ learning is defined by people’s responses to their new knowledge, new understanding, and new actions transforming the world. In both instances above, the disruptions in relations were resolved in such dialogue. Culturally sensitive guidance is based on the expectation and active promotion of collusive dramatic events around subject matter. In the first instance, when the students could not relate to Charisma or focused on how punish her for the drinking incident, the instructor considered this emerging collision between him and the students and between the students and Charisma as blessings and learning opportunities for all (although risky ones). Each semester, a class is defined by its participants in terms of the “hot topics” that are a reflection of these dramatic collusive events that emerged in the classroom. In our case, the dramatic collusive events did lead to “creolization” and development of a new “we” both between the instructor and the students, and between the students and Charisma. Of course, this creolization has limited character: at the end of the semester, only four students developed a deep friendship with Charisma, not all of them. We argue that culturally sensitive guidance has to always involve creolization (although maybe limited) and the development of a new “we” through the sharing of participants’ subjectivities. Aaronsohn, E., Carter, C. J., & Howell, M. (1995). Preparing monocultural teachers for a multicultural world: Attitudes toward inner-city schools. Equity & Excellence in Education, 28(1), 5-9. Bakhtin, M. M., & Emerson, C. (1999). Problems of Dostoevsky's poetics (Vol. 8). Minneapolis: University of Minnesota Press. Bakhtin, M. M., Holquist, M., & Emerson, C. (1986). Speech genres and other late essays (1st ed.). Austin: University of Texas Press. Barth, F. (1969). Introduction. In F. Barth (Ed. ), Ethnic groups and boundaries: The social organization of culture difference (pp. 9-38). Boston: Little Brown and Company. Bibler, V. S. (1991). Michail Michailovich Bakhtin or the poetics of culture. Moscow: Progress. Cabello, B., & Burstein, N. D. (1995). Examining teachers’ beliefs about teaching in culturally diverse classrooms. Journal of Teacher Education, 46(4), 285-294. Dewey, J. (1925). Experience and nature. Chicago: Open Court Publishing Co.
Freeman, D. J., Brookhard, S. M., & Loadman, W. E. (1999). Realities of teaching in racially/ethnically diverse schools: Feedback from entry level teachers. Urban Education, 34(1), 89-114. Gergen, K. J. (1994). Realities and relationships: Soundings in social construction. Cambridge, MA: Harvard University Press. Haan, d. M. (1999). Learning as cultural practice: How children learn in a Mexican Mazahua community. Amsterdam: Thela Thesis. Hargreaves, A. (1994). Changing teachers, changing times: Teachers' work and culture in the postmodern age. London: Cassell. Harris, J. (1995). Renegotiating tne contact zone. Journal of Basic Writing, 14, 27-42. Headland, T. N., Pike, K. L., & Harris, M. (1990). Emics and etics: The insider/outsider debate (Vol. 7). Newbury Park, Calif.: Sage Publications. Kaplan, R. B. (1966). Cultural thought patterns in inter-cultural education. Language Learning, 16(1-2), 1-21. Latour, B., & Woolgar, S. (1979). Laboratory life: The social construction of scientific facts. Beverly Hills, CA: Sage Publications. Liston, D. P., & Zeichner, K. M. (1996). Culture and teaching. Mahwah, NJ: Lawrence Erlbaum Associates. Lotman, Y. (1988). Text within text. Soviet psychology, 24(3), 32-41. Matusov, E. (2002). Culturally constructed guidance and learning: Principles of adult-children engagement in a Mexican Mazahua Indian community and in school. [Review of the book Learning as cultural practice: How children learn in a Mexican Mazahua community by M. de Haan]. Mind, Culture and Activity, 9(3), 241-247. Matusov, E., St. Julien, J., & Hayes, R. (submitted). Building an creole educational community as the goal of multicultural education for preservice teachers. International Journal of Qualitative Studies in Education. Mead, G. H., & Morris, C. W. (1974). Mind, self, and society: From the standpoint of a social behaviorist. Chicago: University of Chicago Press. Pearce, L. (1994). Reading dialogics. London: Edward Arnold. Philips, S. U. (1993). The invisible culture: Communication in classroom and community on the Warm Springs Indian Reservation. Prospect Heights, IL: Waveland Press. Pratt, M. L. (1991). Arts of the contact zone. Profession, 91, 33-40. Sherif, M. (1988). The Robbers Cave experiment: Intergroup conflict and cooperation. Middletown, CT: Wesleyan University Press. Soros, G., Wien, B., & Koenen, K. (1995). Soros on Soros: Staying ahead of the curve. New York: J. Wiley. Thorne, B. (1993). Gender play: Girls and boys in school. New Brunswick, NJ: Rutgers University Press. In this sense, Einstein’s relativism is not pragmatic because it depends on where the observer is located rather than on the observer’s purpose or inquiry dialogically grounded in a community of practice. Although, in our view, this “obsession with difference” is also dialogic like any meaning. Bakhtin (Bakhtin & Emerson, 1999) defined dialogue as the essence of human live, “The dialogic nature of consciousness, the dialogic nature of human life itself. The single adequate form for verbally expressing authentic human life is the open-ended dialogue. Life by its very nature is dialogic. To live means to participate in dialogue: to ask questions, to heed, to respond, to agree, and so forth. In this dialogue a person participates wholly and throughout his whole life: with his eyes, lips, hands, soul, spirit, with his whole body and deeds. He invests his entire self in discourse, and this discourse enters into the dialogic fabric of human life, into the world symposium” (p.293). Of course, this diagram does not represent all possible scenarios of how borderwork and neutralizing processes can unfold and what possible outcome can emerge from them but it provides useful framework for considering them. The issue of objectivizing and subjectivizing is not new in social sciences. Anthropology has introduced the notions of “emic” and “etic” to address this issue (Headland, Pike, & Harris, 1990). Etic represents an approach of data collecting in anthropology based on the information about a studied community collected by a community outsider (often the researcher) through observations and interpretations of these observations – the process of objectivizing. As many anthropologists have pointed out, the etic approach often has its limitations and has historically led to cultural biases because the outsiders’ perception and value system are shaped by his or her home culture which can be incongruent or irrelevant for the observed cultural phenomenon. For example, based on the fact that some traditional cultures do not use “scaffolding” as a form of organized guidance with their children, some Western observers jumped to the conclusion that adults in those cultures do not provide any guidance at all (Haan, 1999; Matusov, 2002). Using our terminology, the etic approach can be characterized by exclusive use of objectivizing studied people from other communities. To compensate this problem, the notion of emic has been developed. Emic involves subjectivizing and represents an approach of data collecting and its interpretation in anthropology based on the information about a studied community collected from community insiders often through interviews or other narratives about the community matters: “An emic unit... is a physical or mental item or system treated by insiders as relevant to their system of behavior…” (Headland et al., 1990p. 28ff).